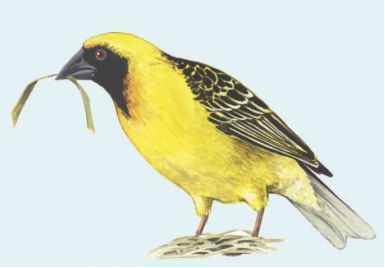 Physical characteristics: Also called the spotted-back weaver and black-headed weaver, the adult body length runs 6 to 7 inches (15 to 17 centimeters), males being larger than females. paralleling the body length. The sides are yellow-brown, and the abdomen is whitish with some yellow. 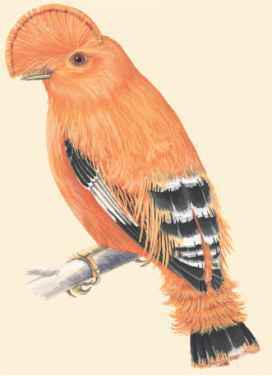 Outside the breeding season, the male plumage closely resembles that of the female, whose colors never change. Geographic range: Africa, western through central to southern and southeastern. Habitat: Open woods, forest edges, savanna, along rivers and streams, often close to or within villages. Diet: The village weaver's diet consists of seeds, green vegetation, fruit, ant eggs, and mealworms. Behavior and reproduction: Mating is at first monogamous, later changing to polygamous, meaning that the birds begin with one mate each and the male eventually finds other females to mate with. After the male has built one nest and attracted and mated with a female, he builds another nest and tries to entice another female to move in. One male may support up to five females in five nests. Females usually lay two eggs per clutch, which hatch in about fourteen days. The male builds the nest, which holds one female and young, out of grass blades or other vegetation. Village weavers derive that common name from their frequent habit of nesting near villages in Africa, probably for protection from predators that naturally fear people. Village weavers are well-known for their skills in adapting to new environments, often ones much different from the original and far from home, including the New World, where they were brought by humans. The species has been living on various Caribbean islands for two hundred years. On Hispaniola, village weavers have adapted to near-desert conditions by eating the fruits of the Stenocereus hystrix cactus and depending on them for water. 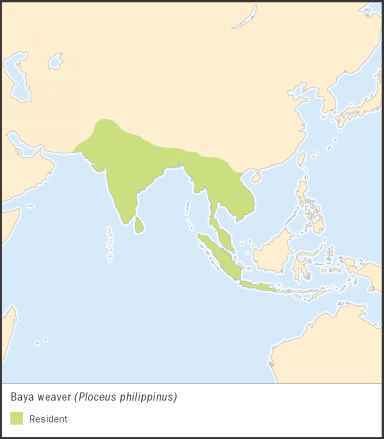 Village weavers might be frequent hosts for parasitic eggs of the dideric cuckoo. However, village weaver eggs frequently and constantly change color among individual females. Part of the ploy of brood parasites is ensuring the intruder egg closely resembles the host eggs, especially in color. Otherwise, the host mother may spot the intruder egg and pitch it from the nest. Village weavers keep ahead of the game by constantly changing egg colors to keep the parasitic weavers confused. Village weavers and people: Village weavers may make minor nuisances of themselves by raiding grain crops for the seeds.